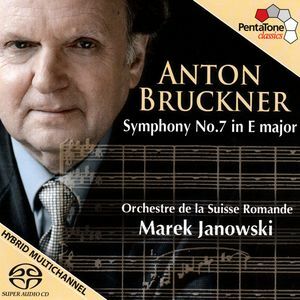 I've been reading all sorts of good things about this new Bruckner 7 from Marek Janowski and the Suisse Romande, but I'm having a lot of trouble getting on with it myself. The orchestra play well, but Janowski's interpretation just leaves me cold. The first movement is slow, not fatally so, but slow enough to make coherent phrasing a struggle for all concerned. The tempo relations between the sections have obviously been worked out with extreme care, but the result is an excessively careful interpretation. Of all Bruckner's symphonies, the Seventh is the one in which the internal structuring of the movements is secure and logical enough that the conductor can afford to take risks. Not Janowski though, he only changes gear when he absolutely has to, creating a stark contrast been sections of exposition and transition. The second movement is better, but this too is on the safe side. It is in this second movement that the quality of the orchestral playing begins to redeem the performance. Every section of the orchestra gets a moment to shine here. But this too is a safe performance. If anything, it could be slower a lot of the time, and Janowski could certainly allow himself to let go a lot more. Some bigger swells from the strings would help everybody live in the moment, without worrying so much about the architecture. Ironically, when he does reach the climax, he has spent so much effort on preparing it that the moment itself is underwhelming. The cymbal crash is included, which is just as well or the moment could pass you by. So too with the scherzo and finale. All the notes are in the right places, but there just isn't the excitement in the scherzo to make the thing worthwhile. And the finale, while it has occasional moments of real beauty and rarer but notable moments of real drama too, falls flat. The ending of the work is a problem for any conductor. It has to build up to something monumental, and then conclude without sounding like it has just stopped mid-phrase. As with the adagio climax, Janowski does everything in his power to prepare for the last pages, but when they actually arrive there is nothing particularly monumental or conclusive about them. The orchestral playing deserves higher praise, as does the SACD audio. In fact, they work in tandem to bring some interesting and often overlooked aspects of the score to attention. The horn section is assertive and bold, and a number of horn counterpoints that I hadn't heard before come through in the scherzo and finale. The lower brass also have impressive clarity, although their tone is sometimes a little raspy. The balance between the top and bottom of the orchestra is always impressive, and this is something Janowski deserves credit for. The quality audio allows the listener to hear the details at both ends of the spectrum, and the relationship between those extremes, between the trombones and violins say, is always ideally balanced. Perhaps I'm being unfair on Janowski. I've certainly heard worse recordings of the Seventh, and if he takes the first movement too slow and with excessively rigid tempos, that's less of a crime than the many faster and more erratic ones on the market. It is just all a bit too reverential for my taste. Janowski is faithful to the letter of the score, but he misses its spirit. That's a shame, because he has clearly instilled an impressive sense of discipline into his orchestra. Now that they are doing exactly what he wants, perhaps it is time he loosened up a bit himself.